Sergey Roldugin was born in 1951 on the Sakhalin Island. At the age of five, he began to play music, initially the piano, and at the age of eight – the cello. He graduated from a musical school in Riga (1970), the Leningrad Conservatory (1975), completed Professor Anatoly Nikitin’s class, who directed his assistantship – internship. 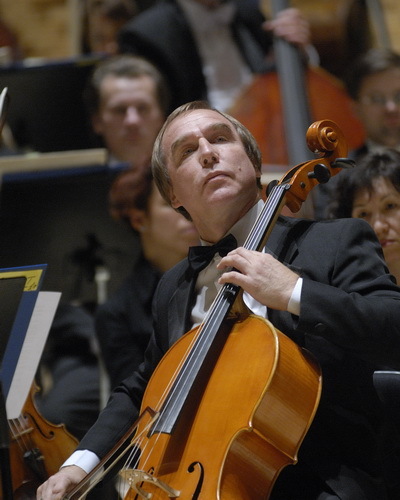 Sergey Roldugin is an laureate of the Prague Spring International Music Festival (1980). As a student he was employed in the D.D. Shostakovich Leningrad Philharmonia Academic Philharmonic Orchestra headed by Yevgeny Mravinsky, where he worked for 10 years. From 1984 till 2003 he was the principal cellist of the Mariinsky Theatre orchestra. As a soloist Sergey Roldugin cooperates with orchestras of the Moscow, Novosibirsk, St. Petersburg, Samara Philharmonias, the Svetlanov State Academic Symphony Orchestra, the Orchestra of St. Petersburg Capellar, takes part in top music festivals. During 2003-2004, he was the rector of the N.A. Rimsky-Korsakov St. Petersburg State Conservatory. Since 2006 Sergey Roldugin has been the artistic director of initiated by him St. Petersburg Music House – a federal institution training young Russian soloists of classical qualifications for international contests. He insisted on a full-scale restoration of the listed building – Alexeevsky Palace, which now houses master classes and chamber concerts of youth projects of the St. Petersburg Music House. In 2011, he was awarded the Order of Honour for his great contribution to the national musical art and training of young musicians. In 2016 – was awarded the Order of Alexander Nevsky. In 2017 – the Kazakh Order of Dostyk (Order of Friendship) of the 2nd Degree. In 2004 Roldugin started as a conductor. He is a guest conductor of the Mariinsky Theater. He performs with top symphony orchestras of Russia, as well as abroad: in Germany, Finland and Japan. Sergey Roldugin gives concerts in Russia and Europe, successfully cooperates with such conductors as Valery Gergiev, Yuri Temirkanov, Arvid Jansons, Mariss Jansons, Saulius Sondeckis, Yuri Simonov, Martyn Brabbins. In May 2016, Sergey Roldugin participated in a concert of the Mariinsky Theatre Orchestra in the amphitheatre of the Syrian city of Palmyra. His extensive solo and orchestra repertoire includes compositions of various epochs and styles. Sergey Roldugin has been also involved in TV and radio recordings. Annually, he gives master classes in Russia, European countries, Korea and Japan. He also participates in juri of the national and international contests. P. Tchaikovsky. Piano trio "In memory of a great artist"
G. Belov. Rhapsody for cello solo After Ivan Turgenev's "Singers" from "A Sportsman's Sketches"